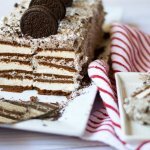 The EASIEST ice cream cake you'll ever make — only 3 ingredients and no baking required! Chop Oreos in food processor until finely ground. Add ground Oreos to mixing bowl containing 2 cups Cool Whip. Fold ground Oreos into Cool Whip until well combined — this is the "frosting." Place four ice cream sandwiches together in center of baking mat. Spread a layer of frosting on top. Repeat with two more layers of ice cream sandwiches. Frost the top and sides of cake. Allow cake to set in freezer for 1-2 hours. Remove from baking mat. Slice and enjoy!